As winter starts to give way to spring, and dates have been announced for SWW 2009, I can reflect back on the last 9 months. My company shut down in May, I went to SWW in June and got to meet up with some friends, I started a new job the day my old one officially ended, and flew like a roller coaster on the stock market. 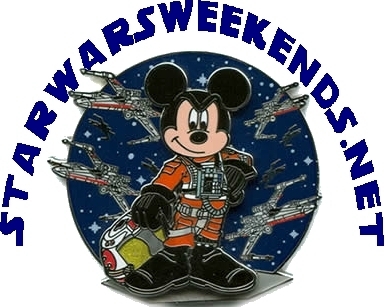 Now as May approaches the reality is setting in that we will not be attending SWW in 2009. The dates this year are while us nor'easters are still in school. Between a boy scout 2 week high adventure trip of hiking through the New Mexico mountains and a couple weeks of horse camp this summer, the time and $$ are all allocated for other things this year. I will try to keep up with the events of SWW09 and post any pictures that come my way. And what an eventful year it has been. I made it down to Star Wars Weekends for week 3 and had a good time finally meeting some of the people who I have been chatting with for the last 15 months. My company suddenly shut down on May 19th, but I was able to stay on to help wind down operations and close the buildings. I was able to find a new job that will start on the same day my time at my closed down company ends. Like all other Star Wars geeks, I have a massive collection of "stuff". Many are the toys my kids grew up playing with, but there were some that were on display. This included a full collection of every one of the large "unleashed" figures, and my best collection, every single one of the Action Fleet items, including errors and international only releases. In my basement were 4 bookshelves that covered 10 feet wide and 6 feet high, with 6 shelves on each (7 when you count the top). That's 70 feet of display space, and it was all filled. Across the top were all the unleashed figures. On each shelf was a theme, such as X-wings on one, Ties on another, and one shelf of the expanded series. The best ones I scored were the E-Wing, Tie Defender, and the others in that rare series at a Rite Aide for 10.99 each (of course I bought every one they had and made a killing on e-bay). This was not a display of items in boxes either, I wasn't looking for MIB items to sell later, I wanted them out so people could see and touch, so everything was out of their boxes. Then, one April day in 2007, the rains came, and kept coming, and kept coming. One of the kids said "Daddy, why is the floor wet" The carpet in the basement was wet. Water was getting in from somewhere. We tracked it down to behind one of the display cabinets on the end. So I had to take everything off that bookshelf, disconnect it from the other shelves (I had them bolted together), and move it out so I could dry the carpet. When I moved the shelf, I saw the mold and water damage on the back. It looks like water had got in back there before (the shelves were there for 5 years). So now I had to take the other bookshelves apart. The items from the displays filled 6 rubermaid tubs. All the shelves had damage on the back, and needed to be thrown away. I had to reseal the walls, and knew I could not place solid shelves there again. So now my beautiful display sits in a stack of plastic tubs. Now comes the worst part. In my rush to get it cleaned up, I didn't take any pictures of the displays before taking them apart. And I can't find any pictures of it anywhere! I can't recreate it for a photoshoot because the shelves are gone. Scouseyank? How did you ever get a name like that? I am not from England, am not English, and have never been there. But I was a fan of LFC (Liverpool Football Club) when a group from our London office came to New Jersey to work here. I met up with a true Liverpool Scouser and we became fast friends. We would even go into work at night, call the London office, put the phone on speaker, and have them put the phone on their side next to the radio so we could listen to the matches. Being all American, I became known as the “yankee scouser”. Somehow that got twisted into ScouseYank, which works out well for me because no one ever has that name when you need to register on any website. Scouse (rhymes with mouse) is the accent and dialect of English found in the north-western English city of Liverpool and in some adjoining urban areas of Merseyside. The Scouse accent is highly distinctive and sounds wholly different from the accents used in the neighboring regions of Cheshire and rural Lancashire. Inhabitants of Liverpool are often described by the slang term Scousers, especially supporters of the local footy (soccer) team. It actually originates from a stew or casserole which people from Liverpool used to eat!! They used to keep a big pot on the stove when they were poor, and during the week all the leftovers were added to the pot and they would eat it at weekend...this stew was known as scouse!! It was May, and my family was going on a Disney cruise. Not just me, the wife, and the kids, but my whole family. Mom, Dad, Brother, Sister, their kids, etc. 16 of us in all. 12 of them went to Disney first (land and sea cruise), but we did not, because we were there in November the year before and we had plans already for another week at Disney in the coming November and just wanted to do the cruise this time. Before and after the cruise we planned to do some of the other Florida things, like the Astronaut museum, nature cruise in the Indian River, Gatorland, and other things, but not Disney. We stayed in Coco Beach before the cruise at what we thought was a nice hotel. Giant two bedroom suites! We did some local things, then went on the cruise. When we returned on Thursday, we checked into a different room at the same hotel, except now we were in the beachfront building. We went on the nature cruise, ate alligator tail, went to Ron Jon, and went back to the room. Our flight back north would be on Sunday. Again, we had absolutely no plan to go to Disney. After a while in the room, my daughter said “Daddy, can you kill these ants?” I went over and looked. They were not ants. We gathered up all the clothes and luggage we had been sorting out and placed them on the dining area table, kitchen counters, and other tabletops. About a half hour later, the wife saw more of the bugs, this time on the kitchen counter. The evacuation began. “Where do you want me to take you at 11:00 at night” I asked. “The only place I will feel clean is at…..DISNEY” was the reply. So off we went to Disney. “We can stay at one of the resorts, but we are NOT going to the parks” I said, “we are sticking to the plan and going to other places”. All Star Movies, our usual resort, was full. We got a room at All Star Music. I went to check in. I was at the desk, and saw the brochure next to me. Star Wars Weekends “What is this about?” I asked They told me. I read the guide. I was there in the theatre for the first three movies. I had all the cool toys back then (my mom gave them away while I was on an aircraft carrier for 6 months, but that’s another story), the first thing you saw when you walked into my place was a Rancor, you get the idea.